All great gear comes with a story! Whether the adventure of the day is summiting Everest [which we don’t yet have any plans for], snorkeling with countless iridescent fish above an endlessly kaleidoscopic reef off the coast of Bali, or exploring Singapore on foot in the torrential rain, the gear you choose to support your adventure has the curious tendency to amplify both positives and negatives of any experience. Opting for higher quality trustworthy gear typically accentuates the positive and infuses an essential peace of mind into the experience of the adventurer. That’s how we see things at least! 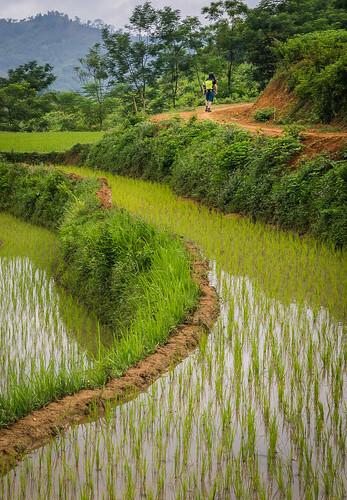 Awestruck high in the mountains of northern Vietnam's Ba Be Lake region on our 23km trek up through the mountain villages of the area. Two pieces of critical gear which Dina and I have found ourselves ceaselessly appreciating along our journey have been our Velo Transit waterproof backpacks. 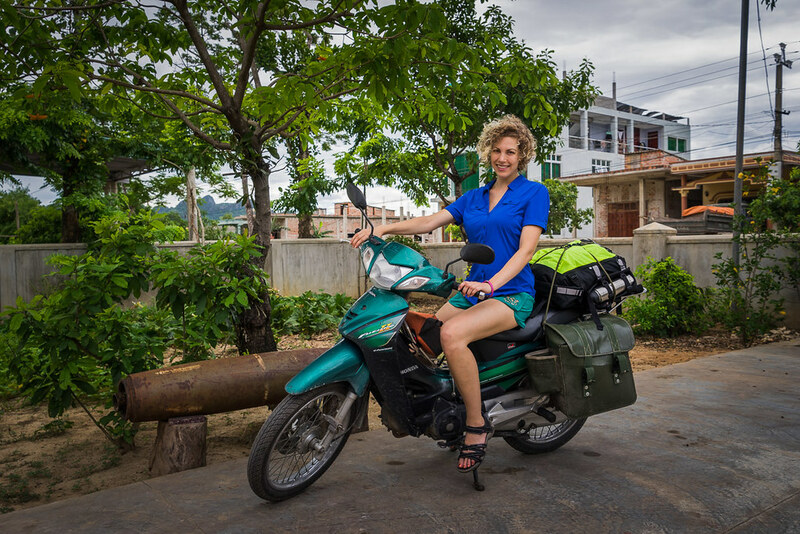 Based in Dina’s hometown of Seattle, Velo Transit is a small family owned company that produces a high quality collection of handmade any weather waterproof backpack options primarily targeting the needs of cyclists. We came to learn of Velo Transit shortly after moving in to our Old Rainier Brewery space down in the SoDo industrial district of Seattle south-east of the sports stadiums. Steadfastly positioned out front of one of our neighboring buildings was a mannequin in a rain jacket and a backpack which you can only drive past so many times without scratching the itch of curiosity. Scoping the vicinity online led me to their company’s website and by the time I ventured over in person, they were gone! Gasp!! No worries, a significant upgrade in manufacturing real-estate took them out of SoDo and over to the University District area along the well-known Burke Gilman Trail. Perfect location to attract all those soggy Seattle cyclists peddling this way and that. Stopping over into VT’s showroom introduced us to Paul, his wife Bobbi, and their little one. An hour or two later, we felt like a part of the family and were genuinely sold on two freshly constructed packs for our journeys. Given the size of their operation and their penchant for quality products, customization was encouraged and Dina ended up having a wonderful set of hip pads added to her pack to take away the inevitable pain she gets on long hikes with nylon straps mercilessly crisscrossing her hips. Procuring our packs only weeks before our departure from Seattle left us no real chance to get to know them before the journey. These were our packs, for better or for worse! All doubt quickly dissolved during our US road trip as we toted our gear out into the freezing dunes of White Sands New Mexico, through the sopping wet Florida Everglades, and into all sorts of cafes along the way. A day in the big city!? Well, not to fear. Fair weather city slickers are covered too! Here I am in front of the ION Orchard super mega mall in downtown Singapore! Since then, we've taken the packs everywhere! Our laptops are typically nestled safely and securely within while cushioned by the pack’s half inch protective foam backing. An additional accessory we found bringing additional peace of mind is Eagle Creek's Specter Laptop Sleeve. When packed appropriately, they fit snugly under the seat while flying. 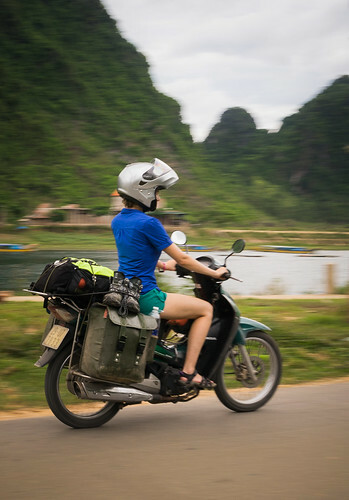 When securely bungeed, strapped, or tied to your motorbike, they can stand up against the gnarliest of monsoons that Southeast Asia can throw at them. When encased in steel cable mesh and locked to heavy furniture, they become even less appealing to try and steal from given their double folding top entry vs. your typical zippered pack. For a casual stroll across town in the pouring rain, an intense trek up ancient village footpaths, or even a quick dash from here to there, our packs have instilled confidence and frequently turned up in conversation with others curious of where we got them. 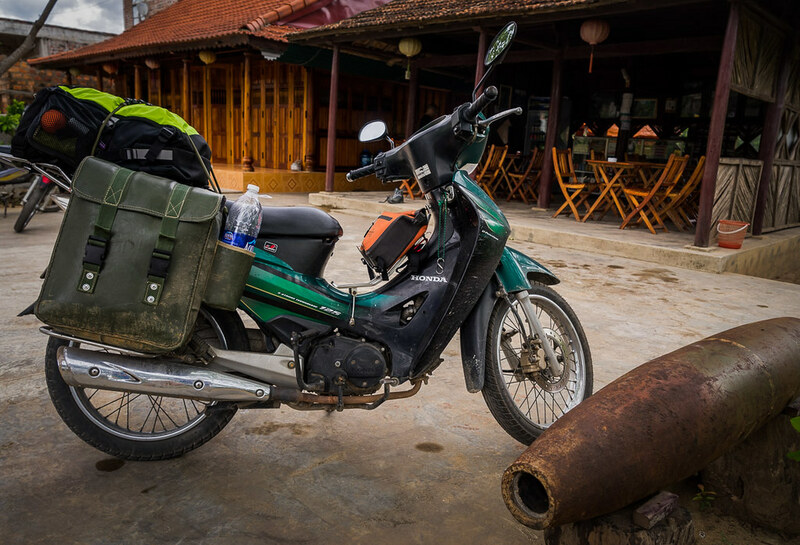 Gearing up for our day at Ho Khanh's farmstay ... the local man in Phong Nha that discovered the world's largest cave, Son Doong Cave. Still no shortage of old UXO remnants from the war in this part of Vietnam. 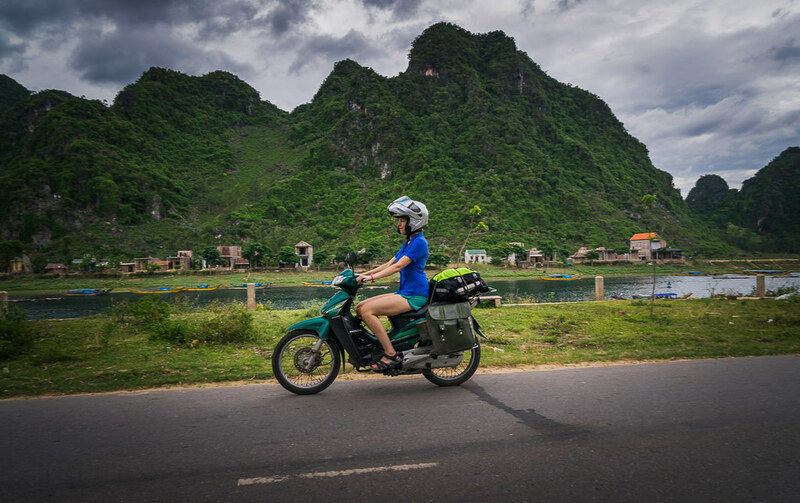 Cruising through the village of Phong Nha nearby the Phong Nha Ke Bang National Park, home of Son Doong Cave. 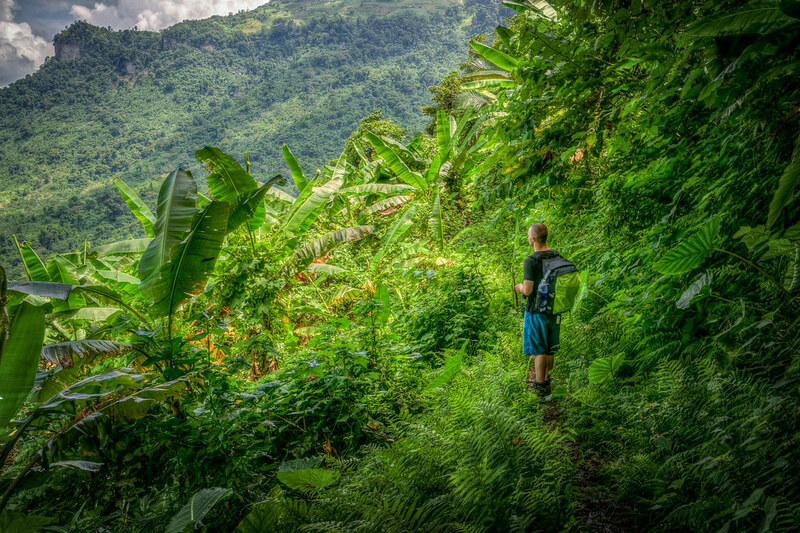 The mountains in this region are stunning and teeming with life in the tropically hot and humid climate. I have slight scoliosis and have had issues with every pack I have ever worn. I can’t even wear most necklaces without getting some sort of pain down my neck and shoulders. When I first tried the pack on in the shop, Paul put in maybe 25 pounds worth of power tools and I did not feel like I had anything on my back. He had to remind me to take off the demo pack at the end of our talk. The pack has remained just as comfortable throughout our travels. I can happily carry it around all day with no back issues at all. Women specific sizing and solid but unobtrusive padding in the right areas makes this my favorite pack ever! Oh, yeah, did I mention it’s 100% waterproof? All in all, we’ve loved our packs dearly and happily and shamelessly endorse them for your next adventure! 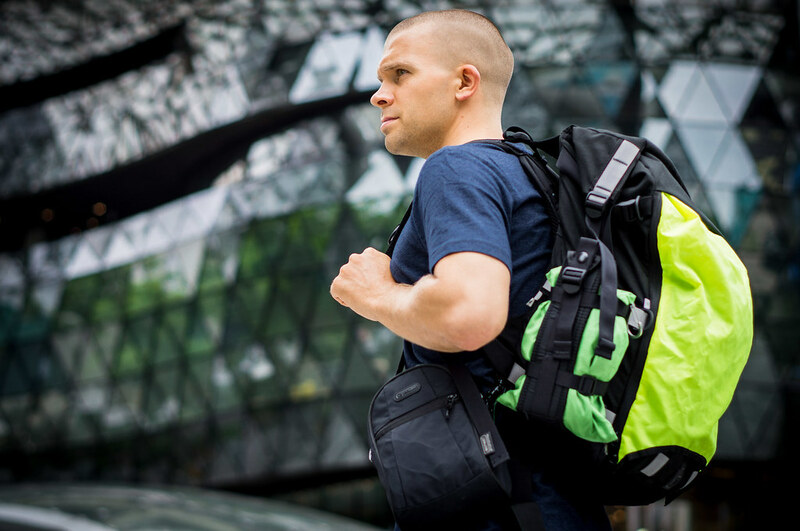 Check out Velo Transit's waterproof backpack line today. Please note, at the time of writing this article, we are in no way affiliated with nor receive funding from Velo Transit for our endorsement. We have remained in touch with Paul and Bobbi and admire their efforts and hope to again cross paths. Their ethically minded manufacturing and business practices are admirable and we wish them the best of luck in the sea of the “profit at all costs” mindset that the business environment that they participate in is enveloped by. November 2015 Update! Paul has introduced an affiliate marketing link for fans of his company's packs to help direct traffic to his site. We've implemented these links within this article now so in theory, if you like the pack, and click on the links in the article above, we should receive a small commission on driving traffic over to them. Happy to help Paul!